BRDC MARATHON RUNNERS - 12 DAYS TO GO! 14 Members of the British Racing Drivers’ Club are gearing up for one of the most prestigious endurance races next weekend. No it isn’t the 24 Hours of Le Mans or the Twelve Hours of Sebring or even the 1000-mile Petit Le Mans. Andy Priaulx, Oliver Gavin, Darren Turner, Jonny Kane, Johnny Mowlem, Guy Smith, Charlie Hollings, Rob Barff, Sean Edwards, Richard Westbrook, Peter Dumbreck, Marino Franchitti, Stuart Hall, Marc Hynes & BRDC Club Secretary, Stuart Pringle will be trading in their race helmets for running shoes to compete in the Virgin London Marathon on Sunday 25 April. 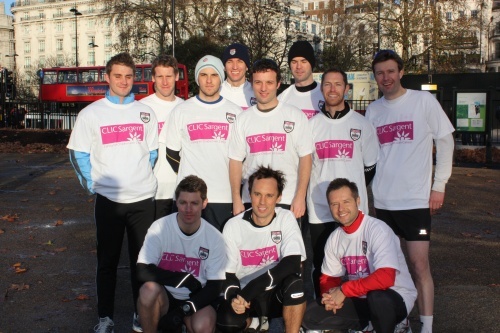 All BRDC drivers are running for CLIC Sargent, a children’s cancer charity, with the goal of raising £50,000. CLIC Sargent, which supports children and young people and their families that go through the physically and emotionally tough times of battling cancer, is also the official charity of this year’s marathon. The BRDC marathon team is led by ‘team captain’ Olly Gavin, who has quickly established himself as a seasoned veteran of marathons. The Corvette Racing driver will be making his fourth appearance at the London Marathon, having also competed in the Paris edition in 2005. This time, Gavin has something to prove, after missing out on his target by mere seconds last year. “Last year I ran in the London Marathon and I did three hours and 10 seconds,” Olly said. “I was desperate to get under the three-hour mark, but I missed it by those 11 seconds, which is hugely frustrating. Jan Magnussen said he laughed so much that I missed it by 11 seconds, which is typically Jan! I don't think Jan would run any further than to the drugstore and back! With 14 other ‘opponents’, ask any of the drivers and they won’t hide their competitive mindset. But drivers like Guy are taking a realistic approach to the marathon. While he reckons the likes of Olly and Stuart Hall will achieve a sub three-hour result due to their experience, Guy is shooting for a three-hour and 30-minute run. The Patron Highcroft Racing driver feels one of the biggest advantages the team has comes in the shoes. London-based Pro Feet has supported the BRDC gang with making custom insoles for each runner. Marino says the difference is night and day, as he’s been able improve his performance over long runs in practice. Olly Gavin has his personal goal of breaking the three-hour mark, not just to see the look of his Corvette Racing teammate’s face if he achieves it, but also to achieve his personal goal. With the runners representing various championships including the ALMS, Le Mans Series, FIA World GT1 Championship, World Touring Car Championship and Porsche Supercup, everyone’s been able to pool their resources together to help with the efforts. The BRDC Marathon Runners have already raised over £35,000 and together with the BRDC are hosting a Charity Lunch at Plaisterers’ Hall on Friday 23 April with a host of motor sport legends attending and an auction. For ticket information please contact Hannah in the office on 01327 850 925 or visit www.justgiving.com/BRDC-marathon-legends to make a donation.